Livelooping genius Randolf Arriola has chosen the RC-505 as the new central piece of his massive “Oopah Loopah” pedal board. In the “Live Loop Asia” Facebook group, he has put together some paragraphs containing user experience, reviews, wish list and user tips with this box. The use of the live looper device has many creative musical applications and my personal use of it ranges from practicing, improvisational, compositional, teaching, leisure, therapy, art and entertainment. A great tool becomes an even greater instrument when it inspires and invokes the creative spirit of any individual into unconditional free play and through that find his/her voice of self expression for personal, leisure, professional or artistic pursuits. The following is my wish list based on my personal experience with the Boss RC 505. Hope this is somewhat helpful to you. The RC505 does something remarkably brilliant which is it allows eg. Track 1 & 2 to be configured as “Multi” and Track 3,4,5 as “Single” This effectively allows Track 1&2 to keep running whilst the player keeps switching between Tracks 3,4,5 much like switching between Verse/Chorus/Bridge as in most song structures. Trk1 and 2 will keep running much like static Percussion and or Ambient Drone loops. The anomaly with the RC505 is that if Tracks 3,4,5 are equal loop measures, the switching of the tracks will always start on the “1” BUT there is a Problem whenever one of the tracks is longer on one of the loop tracks eg. with “Loop Sync” On, where Trk1 and Trk2 are running together with a 1 bar loop, Trk3 and Trk4 are 4 bar loops and Trk5 is 9 bars (or say odd measures like 5, 6, 7 or even 8 bars) the switching from Trk3 or Trk4 to Trk5 is unintuitive and constantly a hit and miss on starting at the “1” in Trk5 and back to Trk 3 and Trk4 and vise versa. This is with Loop Sync and Tempo Sync On. According to the manual, in order to make sure each track plays back at the Start, Loop Sync has to be individually disabled for each of the Single Loop Tracks BUT this often has a random drift from the Multi Trks 1 & 2 even when Play Quantize is set to either End Loop, Measure or Beat. Among many musical examples that can demonstrate this problem is with the example of the popular U2 song “One” where the verses and choruses are chord progressions over 4 bars (Assigned as “Single” Loop Tracks 3,4) and the Bridge of the song is a 9 bar chord progression also set as Single Loop on Trk 5. In this example Loop 1 and 2 are running ‘Multi’ Loops containing 1 bar each of static Percussion on Trk 1 and Trk 2. Try switching back and forth between Trks 3,4 and 5 and you will see what I mean. Loop Sync in Song Mode allows “Single” Loop Tracks to switch and start at the beginning of the Loop Phrase. Currently with “Loop Sync” On the Single tracks will switch and start at the “1” but if one or all 3 Loop Tracks are of different lengths in Measure the loop track switching is not intuitively starting at the “1”. With the current ver 2.0 as was the original release, to allow the “Single” Loop Track to start at the “1” it is required for the player to individually disable the “Loop Sync” on each “Single” Loop Track but I have found that these Loop Tracks start to drift in time whether the Play Quantize is set for “Rec End, Measure or Beat”. The Boomerang III interestingly doesn’t have this problem. With the Rang, as long as user starts in “Serial” Single Mode by creating an initial loop on Track 3, All other loops regardless of even or odd measure lengths in Tracks 1,2,4 will switch at the end of the playing loop and always start at the switched to loop at the beginning and always locked in sync with Track 3 and in my experience they never drift. This is essential especially for Song Mode styled applications of any multi phrase Looper devices. With version 2.0 Firmware the RC505 is now able to assign the “Phones” Stereo Output as a Sub Line Out which means one can assign any of the 5 Loop Tracks to output from the Phones out but there’s NO Way to mute any of the Loop Tracks from the Main Out. By allowing user to choose which tracks are assigned to either the Main or Sub “Phones” Out one will effectively be able to say assign only vocal loops in Track 1 and Percussion Loops from Track 2 to output via the Phones output leaving the rest of Loop Tracks 3,4,5 to the Main Output. 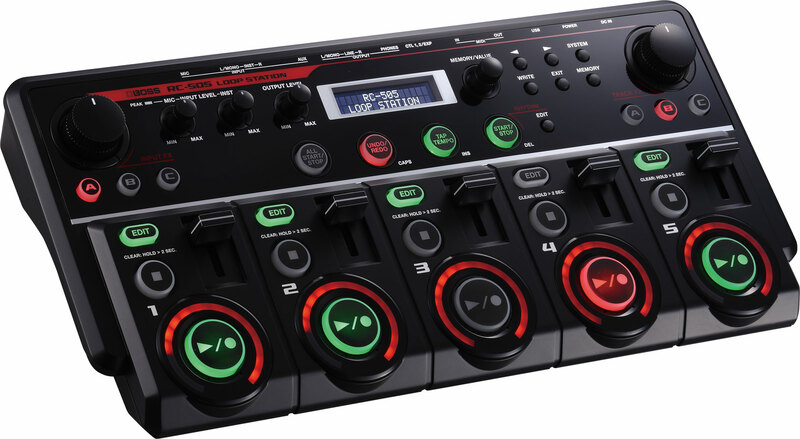 This would make the Boss RC505 an even more powerful and versatile unit for Live use allowing the Sound Engineer at the console to have finer control over the Loops coming via 4 independent channels for a tighter and better FOH mix for the audience. For some reason Roland/Boss in all their previous and existing Looper products never implemented the musical and functional need for Feedback/Decay parameter control to be accessible for the user. The Boss DD20 Gigadelay pedal which has up to 23 Secs of delay time, has that functionality of Decay in it’s range of Delays BUT doesn’t have that in the Looper Mode. Why!? The Feedback/Decay parameter is always a necessary control and if set for anything less than 100% effectively turns the long delay into a modern day “Sound on Sound” “Frippertronics” gizmo! Very Cool for many musical genre applications. How so and what’s the big deal and use for the Feedback Decay? Seriously Lots!!! With Feedback Decay when in Overdub Mode the user has the LIVE ability to perform a very organic “Reel to Reel Tape Recorder” style of Loop Replace, which takes place over anywhere depending on the “Feedback” setting, from one to several or many iterations over the course of the running loop that’s left in constant Overdub mode. In this mode, layers of new overdubs take over the original initial loop contents that slowly fade/decay away and eventually replaced with new Loop content. All this happening whilst still maintaining within the running loop phrase measure. This parameter control can be ideally assigned onboard the RC505 and provide user option for external expression pedal or CC# MIDI controller. Imagine this for yourself by simply tapping your foot on the downbeat eg. 4 to the floor kick drum at 120bpm whilst beatboxing rhythmic variations constantly and when you’ve found the right groove commit that to the loop and change it later but never stopping the groove and you will get the idea. The musical applications for this is much needed as it is immensely wide, psychedelic and SUPER COOL!. The beat boxer or musician with creative command and control of this Feedback/Decay functionality will be able to effectively perform much like the way a DJ mixes in a typical long continuous live set keeping the rhythm and beat but constantly throughout the set morphing and replacing new tracks. Existing Loop devices that I’ve previously used that do this include the Boomerang III, Pigtronix Infinity, Line 6, Eventide H9 and Time Factor and TC Helicon VoiceLive 3. Currently it is wonderful that the RC505 has pretty good visual indicators that show the operational status of the loop track including Play, Stop, Overdub and also Position and Length of the Loop Track. Because of the problems I highlighted in No.1 of this wish list, when any loop track is in Stop Mode, there’s no indication where the “Muted” Loop Track’s position is within it’s measure. This is especially a problem if the player wants to maintain the use of the “Loop Sync” left On which maintains the loops to maintain locking in sync with the 1st Loop track but as mentioned in wish list point no. 1, it DOES not intuitively start at the “1” when switching between the assigned Single Loop Tracks.